If Washington voters OK a carbon-pollution fee, who decides how to spend all that money? The carbon fee — estimated to raise roughly $1 billion annually by 2023 — would fund a surge in state spending to cut fossil-fuel use. Proponents say that is what’s needed to get the job done, while opponents raise concerns about a powerful new board directing investments. A carbon-pollution fee on fossil fuels — if approved by voters in November — would finance a multibillion dollar spending surge intended to cut Washington greenhouse-gas emissions. 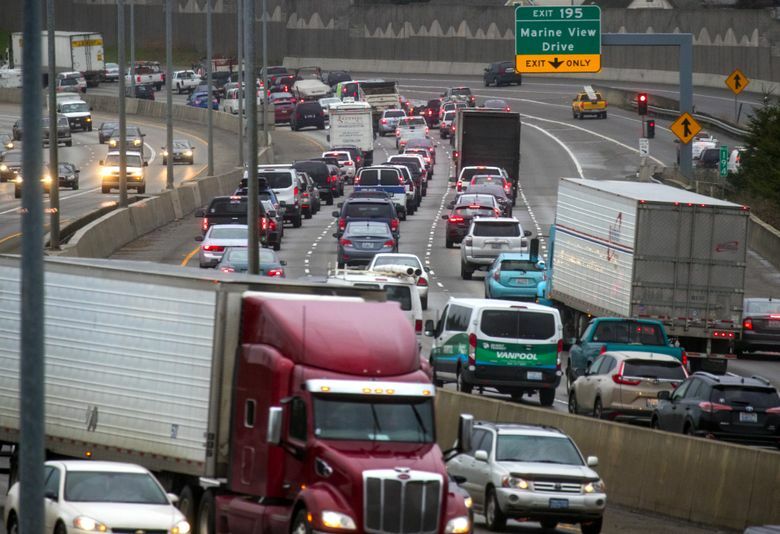 Initiative 1631 reflects the proponents’ faith that an activist government can play a key role in speeding up a transition to cleaner fuels and helping the state adjust to a century of climate change. The spending — roughly $1 billion annually by 2023 — would be funded by a carbon fee on fossil fuels that would rise each year. The statewide ballot measure was developed by a coalition of environmental, labor, tribal and social-justice groups. It vests a 15-person board — a mix of state officials and public members appointed by the governor — with the authority to develop an annual investment plan. The options could range from helping people buy electric cars to thinning fire-prone forests. Because revenues would be generated by a fee and not a tax, the Legislature could not shift the money elsewhere, such as for health-care spending or education. “The dollars will go directly toward solving the problem, and won’t be siphoned off for other purposes,” said Mo McBroom, of The Nature Conservancy, during a debate on the initiative hosted by the The Seattle Times editorial board. The measure comes in an election year when plenty of voters — even in the green stronghold of Seattle — are wary of rising taxes and questioning the effectiveness of government spending. The opposition campaign is playing to those concerns in a high-profile, big-money campaign that benefits from more than $11.5 million raised largely from oil companies — an amount more than double the $4.8 million raised by proponents. The California state Legislature passed a cap-and-trade system that puts a price on carbon emissions. 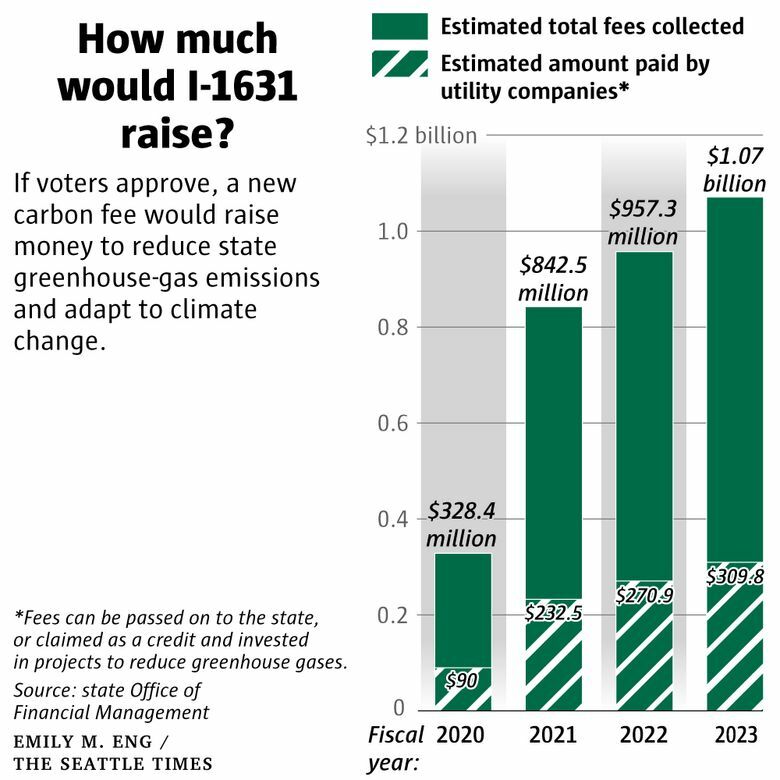 But if I-1631 passes, Washington would be the first state to approve carbon pricing through an election. These emissions, primarily carbon dioxide from fossil-fuel combustion, trap heat in the atmosphere. Scientists say the effects of this pollution already are underway, and they include rising sea levels, more extreme weather events and increased wildfires. The carbon fee initially would be set at $15 per ton of carbon pollution, which would add about 14 cents per gallon to the cost of gasoline, and an additional penny to a gas of diesel. The fee would take effect in January 2020 and increase each year by $2 per metric ton, with an adjustment for inflation. To counter the fee’s regressive nature, the initiative sets aside funds to be used to help lower-income residents reduce fossil-fuel use, and to cut pollution where they live. The fee would be paid by fuel distributors, utilities and some other large emitters, who could pass it on to their customers. Two years ago, state voters resoundingly defeated a carbon-tax initiative that pushed up the price of energy derived from oil, coal and natural gas to drive a shift to alternatives. That measure sought to cushion the economic hit to consumers by reducing other taxes. Most of the groups that have rallied around the 2018 initiative withheld their support for the 2016 campaign. They wanted a measure that would raise new money to invest, not end up revenue neutral. The state tribal leaders included in the coalition have been increasingly vocal about climate change, and they could secure carbon-fee funds to help prepare. “We need to move our entire village. Our jails, our schools, our elders,” said Fawn Sharp, president of the Quinault Indian Nation, about the situation in the low-lying coastal community of Taholah. Proponents also are counting on unions to bring in votes. Jeff Johnson, president of the Washington State Labor Council, helped draft the initiative. It calls for a $50 million fund, replenished annually, to aid refinery or other workers in the fossil-fuel industry who lose their jobs in the shift toward cleaner energy. Johnson says more than two-thirds of affiliates favor the initiative. However, he failed to gain the backing of the Seattle Building & Construction Trades Council, which represents some 20,000 workers, according to Monty Anderson, the council’s executive secretary. Anderson says his membership is often employed in — and supportive of — conservation and clean-energy projects. But many workers have long commutes to their job sites. They don’t want new projects financed through higher fuel prices. The fee could be capped in 2035. By then, it likely would add about 36 cents (in today’s dollars) to a gallon of gasoline. But it could be capped earlier or later than that, depending on how fast the state cuts greenhouse-gas emissions. Proponents say the bite of the fee would ease over time as state residents shift away from oil, gas and coal. And they say oil companies might opt not to pass on the full fee to motorists. The initiative campaign unfolds in an era when international efforts to combat climate change are gaining momentum, spurred, in part, by the 2015 Paris Agreement. That accord was agreed to by nearly 200 nations, and it tries to limit the rise in global temperatures to below 3.6 degrees Fahrenheit — an ambitious goal that appears unlikely to be met. In the United States, the prospects for federal government action nose-dived after the election of Donald Trump. The president has announced the U.S. withdrawal from the Paris Agreement. He also has taken steps to undermine efforts to reduce U.S. carbon emissions, such as a move to relax vehicle-emission standards. In Washington, backers of I-1631 have been frustrated by inaction at the state level. In 2008, politicians in Olympia approved a greenhouse-gas reduction target — a 25 percent cut over 1990 levels. But legislators, during the past decade, have repeatedly balked at passing carbon-pricing bills despite a strong push from Gov. Jay Inslee, who supports I-1631. “This initiative is designed to do something that the Legislature has failed to do … put us on a path to meeting our carbon-reduction goals,” said Michael Mann, a former director of Seattle’s Office of Sustainability and the Environment who helped draft the initiative. Proponents say the 38-page initiative includes safeguards to screen out funding of boondoggle projects, or greenlighting investments in wind farms or other projects that don’t actually need the infusion of state dollars to pencil out. The new state board would have three advisory panels to help sort through projects, and the state Commerce Department would conduct evaluations of whether spending is on track to cut carbon emissions. The initiative calls for the board to confer with the Legislature and governor. “It is absolutely designed for strong checks and balances,” Mann said. But opponents say the board lacks oversight. If it fails to meet carbon-cutting goals, they say the money will still keep flowing in and the spending will continue. “I supported the last (carbon tax) initiative, but I don’t think this is the right approach. It looks like a blank check to me,” said Rob McKenna, a Republican who previously served eight years as state attorney general and currently serves as local counsel for Chevron in King County litigation. McKenna said the Legislature would end up with a broad funding package from the board to approve or disapprove. But lawmakers wouldn’t have the ability to vote on individual projects, which McKenna says is a different kind of accountability. State Sen. Reuven Carlyle, a Seattle Democrat who supports I-1631, rejects such arguments. He says the Legislature will still have the chance to weigh in on the investment package, and it also could vote to alter some of the initiative language if that needs changes. In the decades ahead, just how much money would flow to the state is uncertain, tied to long-term trends in the use of fossil fuels. The state Office of Financial Management has developed a short-term forecast that indicates the fee — by the fiscal year that begins July 1, 2023 — would bring in $760 million for the board to invest. The initiative text calls for the board to direct 70 percent of this money to a “clean air and clean energy fund.” The board would sort through proposals as well as look at bolstering funding for some government programs, and then come up with a plan. Mass transit, bike trails and many other kinds of investments could be considered. Another 25 percent of the money is to be spent for “clean water and healthy forest investments,” which could be preserving farm and forest acreage, restoring estuaries and water-storage projects for agriculture. Initiative proponents have carved out a big role for state utilities, which are forecast, by 2023, to pull in more than $309 million from carbon fees. They could pay that money to the state. Or, they could claim a credit for each dollar of carbon fees they owe and invest that money in conservation, renewable energy or other efforts to reduce reliance on fossil fuels. Those projects would need to be reviewed by the state Utilities and Transportation Commission. The utility ratepayer burden would fall unevenly. Customers served by Puget Sound Energy, the state’s largest private energy utility, would get hit harder since the utility relies on coal and gas for nearly 60 percent of its power. Seattle City Light customers would pay relatively small fees due to the utility’s abundant hydroelectricity.